A small group led by Republicans in Congress spearheaded a bill that passed in the U.S. House of Representatives on Wednesday. If the bill becomes law, it could lead to the eventual extinction of wild salmon in the Columbia and Snake rivers -- iconic species in the Pacific Northwest that the federal government is required by law to protect. House Resolution 3144 seeks to overturn multiple federal court decisions that protect endangered salmon and steelhead. It undermines bedrock environmental laws and forbids any action that might reduce power generation at Columbia and Snake River dams without an act of Congress -- from spilling more water over dams in the spring to help endangered fish migrate, to studying the possibility of removing the four aging lower Snake River dams. "HR 3144 is a giant step backwards in our region's effort to restore salmon populations," said Todd True, an Earthjustice attorney who has been at the forefront of this issue for more than two decades. "The entire goal of the bill is to circumvent the law and the courts, because a few legislators want to put a narrow set of economic interests ahead of the broad support in our region for salmon restoration. They have inserted themselves into the process, without considering the true consequences -- for the fish, our energy future, or the Northwest economy." Rick Williams, a longtime independent conservation biologist and research associate at the College of Idaho, also described the bill as a "step backward," for forestalling any progress on a scientifically sound salmon management plan and attempting to restrict spill. "Studies are very clear that spill (up to the nitrogen gas saturation level) gets juvenile fish past hydro projects with decreased mortality and gets them to the estuary more quickly, in a timeframe that mimics their historical migration time," Williams explained. "This means higher survival rates and greater returns." 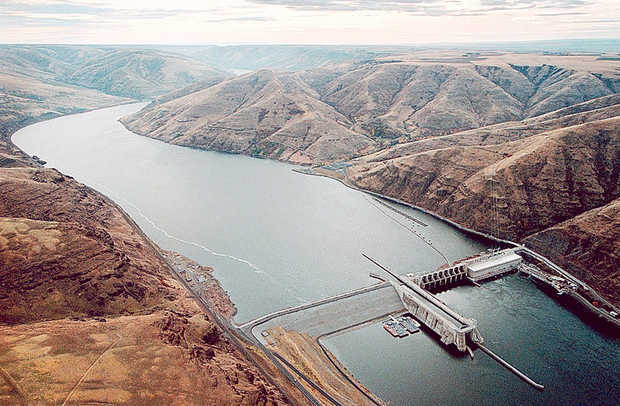 "The whole bill is based on false choices -- on the premise that we have to choose between dams or salmon, when there are robust, affordable energy choices and we can have both," said Liz Hamilton, executive director of the Northwest Sportfishing Industry Association. Joel Kawahara, a commercial salmon fisherman in Quilcene, Wash., is a board member of the Coastal Trollers Association and Alaska Trollers Association. "The bill's co-sponsors are pitting Northwest fishers and farmers against each other," Kawahara observed. "We're both food producers; our communities and our businesses are both important. We expect our elected officials to bring people together and work on solutions -- such as the Klamath Basin Settlement and the recently formed Columbia Basin Partnership. But instead, we get this divisive bill that locks in failure and conflict. HR 3144 will have a devastating effect on salmon and our region's salmon-fishing sector." Wednesday's vote advances the bill to the U.S. Senate. Individuals and groups will continue to oppose this legislation and will work to convince senators that it's bad public policy that should not become law.